I’ve been silently fuming over this for the past several days. Ontario dairy and grain farmer Andrew Campbell is posting a new photo of what happens on the farm every day in 2015 and tagging it with the hashtag #farm365. 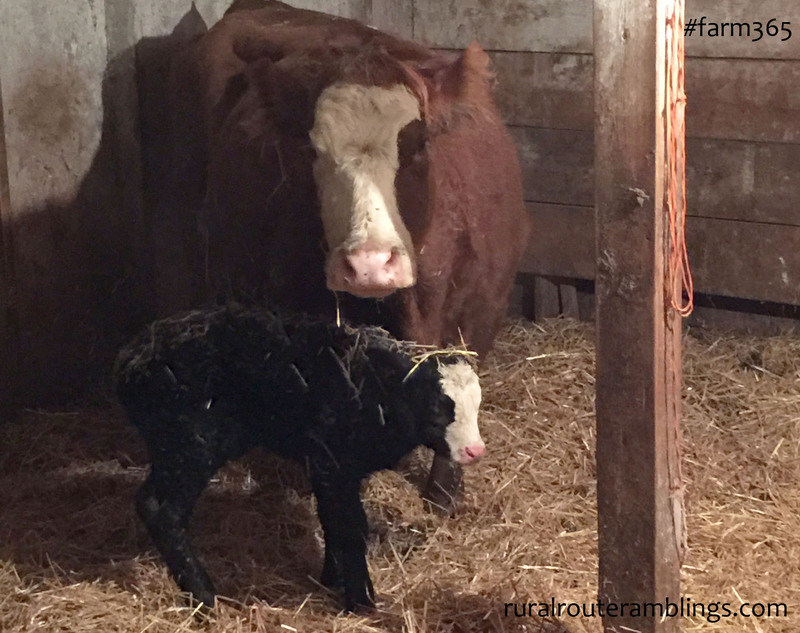 The first photo of the year featured a newborn heifer that was born at 1:40 a.m. on January 1. What an outstanding initiative. I was so happy to read about this. And I was even happier when I heard that other farmers are following Andrew’s example and also sharing farm photos and tagging them with #farm365. Then it took a turn for the worse. Not long after Andrew started posting #farm365 photos, animal rights activists hijacked the #farm365 hashtag and began posting pro-vegan messages. I find this upsetting and hurtful, and I’m not even a farmer. I don’t expect everyone to agree on everything – that’s not going to happen. There’s bound to be differences of opinion. And sometimes we have to agree to disagree. But I do expect people to show respect. And that’s certainly not happening here. These activists are being disrespectful of farmers. arguing about those food choices – many in the developing world do not have these same food luxuries that we so often take for granted here. But what I do care about is respect – in turn, you need to be respectful of my food choices which includes consuming meat, gluten and conventionally produced food (grown with the use of crop protection products). And you also need to be respectful of the farmers who are raising and growing our food. I realize that we all have an agenda. Andrew has an agenda. The animal rights activists have an agenda. I have an agenda. And we all want to further our agenda. And I’m fine with that. But there’s no reason why that can’t be done in a respectful way. Unfortunately, there will always be people and groups out there that only show disrespect, and if you’re going to put yourself out there, you have to be willing to take the heat. I encourage Andrew and other farmers to not be deterred by the haters and to continue to spread their positive message about agriculture. Growing up on the family farm, my brothers and I were taught that you should always be respective of others. Show some respect – these people – farmers – are growing and raising your food. If you’d like to learn more about farm life from farmers, search the hashtag #farm365 on Twitter and Instagram, and I encourage you to engage in positive conversations with real farmers, not activists. You can also follow Andrew Campbell on Twitter as @FreshAirFarmer. Read Andrew’s highs and lows from week one in this blog post. I am convinced a huge proportion of people have no idea where food actually comes from other than the magical supermarket. My personal experience from knowing people with food agendas is it is usually just one more item in their AGM (attention getting mechanism) tool box. The “issues” stretches well beyond food preferences. Off to make italian wedding soup……with pork meatballs, barley and spinach. Thanks for the comment, Deb. I agree. Enjoy your soup – sounds delicious! The soup was awesome. One of my sons had 4 servings! Thank you for your comment. I’m happy to hear that you’ve spent some time talking to various farmers and have found them to be friendly, open and honest. I encourage you to continue engaging in positive conversations with farmers – most of them will be happy to answer your questions about modern agriculture. You are thoughtful, kind and always informative. You are gracious when offering choices and explanations. You did not disappoint me today. We are truly fortunate to have such abundant choices for any kind of food desired at any time of year. And it is inexpensive too! What we forget is these choices come at the risk of the farmers. What if it doesn’t rain when seeds are planted? What if it rains so much crops are flooded and drowned? Or maybe the rain is so heavy the crops are knocked down and the fields are too muddy to harvest? When we moved off the land to work on the clock, we lost our connections to nature. We need the Farmer’s side of the story. Thank you so much for the uplifting comments, Sandra. I really appreciate it. Unfortunately, many people have lost their connection to the land – to farms – this is why we have to continue to tell the farmer’s story and provide Ag education. Thanks for commenting! I encourage you and your husband to keep up the great work on your farm! And I also enjoy reading your blog! As I’ve said before and still maintain, respect goes both ways, and both sides of this debate are equally guilty. There are bad apples in every bunch. When it comes to animal activists being educated? One should never assume. Many of the atavists I know are very entrenched it what they do. They’re respectful, educated, they seek to learn. They ask questions, and many of us have learned directly from farmers. We read, relentlessly, and research (how I found your blog). We approach #farm365 with facts, citations, evidence, statistics, photographs from with link and more. We cannot help the victims without knowing their plight, lest we be regarded as foolish. We are anything but. The disrespect I’ve been shown goes beyond petty, and straight into illegal. This past weekend, a farmer advocate stole my profile photo, made a fake account, and started posting things as me all over the twitter that were incredibly sexual and foul. It was disgusting and really disheartening, even more so, how people were disgustingly interacting with him thinking it was me. This is just one example of a little bit of the picture. In terms of what you said about people respecting what other people eat, there is one thing to me, as an animal rights activist, that trumps how things taste: death. Make that a few things: Suffering, mental and physical pain and death. We all feel the magnitude of death, of pain, fear and suffering. I just can’t understand how anyone can overlook those things, things with so much gravity (the be all and end all), for a glass of milk, or piece of cheese. Especially when our overconsumptio of these things is actually killing us, and furthermore, isn’t required in our diet whatsoever. Life matters more to me that what someone chooses to eat, and there’s where I speak up for the silent victims who cannot speak for themselves. If I were in their shoes, (being artificially inseminated every year, having my children stolen from me, being milked, amongst other injustices) I would want someone to speak for me, AT THE VERY LEAST. At the very least, the truth of the industry should be known, not just the cute little calves by the mother’s side (inaccurate representation of the dairy industry), and other such depictions. I don’t think that the brutal truth should be regarded as disrespectful either. I have been told by many farmers and tweeters alike that I’m respectful, they can actually talk to me (not agree with me), and we talk and leave on a pleasant note. Many are rude and personally attack without me even saying anything to them, and those people I know don’t represent the whole. Regardless, I’m not going to stoop to that level, nor am I going to stoop to the level of generalizing that all farmers are bad people as a whole because I think the practices and coping mechanisms employed by them are inhumane and unjustifiable. Certain aspects of your life, your work, and your representation both, are being scrutinized, yes, but I’m not attacking who you are, but what you choose to do. We’re not all one and the same. Give respect were it is due, and please remember that. Firstly, I never said that animal rights activists are uneducated. I’m saying that I’ve found that they’re often disrespectful of those who do not agree with them – and that’s what I’ve found in this case. I’m sorry to hear that you had a recent bad experience with a farmer. That’s not right. Most farmers, including every farmer I know (which is a lot) would never do such a thing. Another point – I believe that animals are not humans and their lives are not equivalent. Every farm animal is raised with a purpose – whether it be to provide us, humans, with food or byproducts. Finally, I’m not victimizing myself. I’m not even a farmer. I’m an advocate for agriculture. And yes, there are many farmers who are constantly putting themselves out there only to be victimized by activists or others. You don’t have to agree with someone, but you need to respect them. In this case, we’ll just have to agree to disagree. Fair enough, agreeing to disagree. I wasn’t trying to change your mind on anything necessarily, but stating rather, that generalizing that the ‘group’ of animal advocates as a whole are disrespectful is not fair. Disagreeing is not a disrespectful act on its own. Some are disrespectful, some are not. Your blog just seemed to label me as something I am not, I felt. The comment I made about people thinking animal advocates were uneducated was not directed at you, but many of your commenters (I should have clarified). My apologies. The ‘victimizing’ comment I made said ‘most bloggers’, not ‘you’. No offence intended. One last thing. Where you said, “I believe that animals are not humans and their lives are not equivalent,” I get what you’re saying (don’t agree, but you know that), but does this mean to you think that they don’t deserve a life without pain, suffering, fear and death? Where’s the respect in that?